Enjoy homelike comforts and warm hospitality at the DoubleTree by Hilton Hotel Schenectady hotel. Savor our fresh-baked chocolate chip cookie upon arrival and enjoy impeccable service from our friendly staff. 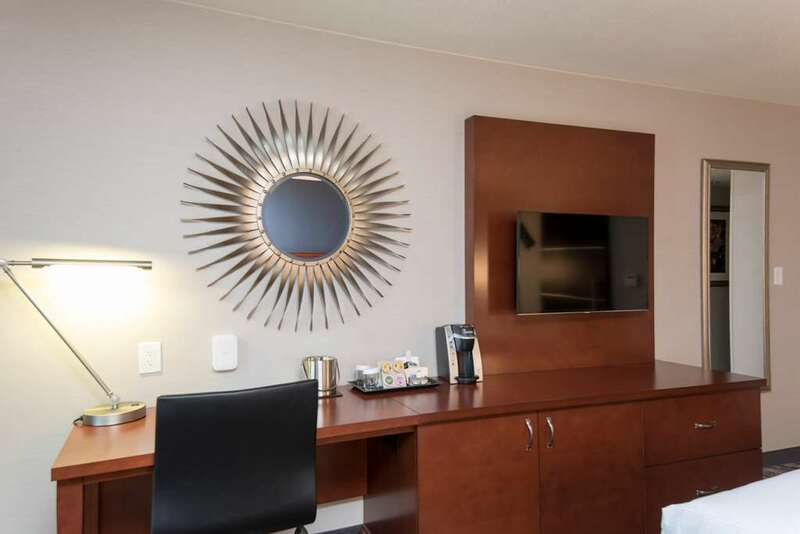 Each spacious guest room and suite boasts tasteful decor and modern amenities including a 32-inch HDTV and complimentary WiFi. Enjoy a restful sleep in the sumptuous Sweet Dreams bed and wake feeling refreshed for the day ahead. Host an important business meeting conference or spectacular wedding reception at this Schenectady NY hotel with over 3 000 sq. ft. of flexible meeting and banquet space. Our dedicated event planner can take care of every detail while our experienced culinary team can create a menu to impress your guests. Catch up with work in the 24-hour business center or de-stress with an energizing workout in the fitness center. The tranquil indoor swimming pool with whirlpool also offers a relaxing setting to unwind after a busy day of meetings or sightseeing. Enjoy a quiet dinner for two or a relaxed family meal in our tempting onsite restaurant. Start the day with all your breakfast favorites then indulge in traditional American fare for lunch and dinner. Whether you crave a hearty beef burger or a healthy salad we*ve got it covered. Our 24-hour Suite Shop is also stocked with a great selection of drinks and snacks to enjoy in your guest room. In the evening unwind a cold beer or cocktail at the bar. Myers Studio - Northeast Ballet Co.